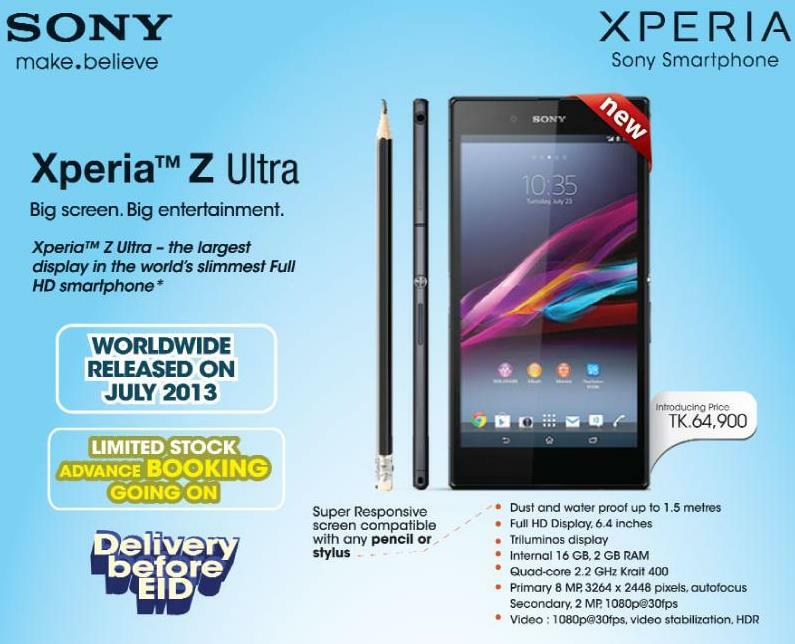 Sony Bangladesh is ready to launch its biggest-ever smartphone (read phablet), the Xperia Z Ultra in Bangladesh within the first week of August. The Xperia Z Ultra is already available for 65,900 taka or $850. Unveiled in June, Sony claims the Xperia Z Ultra to be the world's slimmest and largest full HD smartphone. The phone has a 6.4-inch display and is 6.5mm thick. Xperia Z Ultra is powered by a 2.2GHz quad-core Qualcomm Snapdragon 800 processor coupled with 2GB of RAM. It’s 6.4-inch display is full HD or a resolution of 1080x1920 pixels. It is the first smartphone display that integrates Sony's Triluminos technology, which the company introduced at CES with its Bravia televisions. Sony claims that through the technology the display reproduces a greater range of rich, natural colours to deliver true, natural shades. The technology also includes X-Reality for mobile, Sony's intelligent super resolution display technology which as per the company, analyses each image and reproduces lacking pixels to optimise quality for the sharpest videos. The Xperia Z Ultra sports an 8-megapixel Exmor RS rear camera and a 2-megapixel front facing camera. The device includes LTE, NFC, Wi-Fi, 3G, DLNA and Bluetooth connectivity options. It has a 3,000mAh battery that Sony claims could deliver up to 14 hours of talktime and 768 hours of standby time. It offers 16GB of internal storage that can be expanded up to 64GB via microSD card. According to Sony, the Xperia Ultra Z also includes Battery Stamina Mode, which is said to improve the standby time by four times or more by automatically shutting down battery-draining apps whenever the screen is off and starting them up again when the screen is back on. Just like the Xperia Z and Xperia Z Tablet, the Xperia Z Ultra is also dust and water proof and comes with IP55 and IP58 certification. 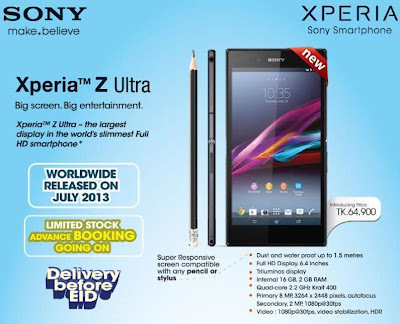 The Sony Xperia Z Ultra comes with handwriting recognition support and the device's screen can work with a pencil or a stylus/ pen that has a tip of more than 1mm (in diameter). Sony also announced some accessories including a stereo Bluetooth headset, magnetic charging dock and a cover with an additional battery, all available for an extra cost.